The Voice of the Future: Are We Listening? Recognizing the state's particular vulnerability to the threats of climate change, Florida Governor Charlie Crist signed three Executive Orders, tackles state's greenhouse gas emissions with a bold, multi-prong approach. Florida Governor Charlie Crist signed three Executive Orders on July 13th, establishing a multi-pronged strategy to reduce the state's greenhouse gas emissions. The Orders set statewide greenhouse gas emissions targets and call for increased energy efficiency, an increased use of clean, renewable energy sources and regulation of vehicle tailpipe emissions. "I am persuaded that global climate change is one of the most important issues that we will face this century," Governor Crist said. "With almost 1,200 miles of coastline and the majority of our citizens living near that coastline, Florida is more vulnerable to rising ocean levels and violent weather patterns than any other state [see graphic above left]." [Executive Order 07-126:] Leadership by Example: Immediate Actions to Reduce Greenhouse Gas Emissions from Florida State Government. This order requires the state government first to measure its own greenhouse gas emissions and develop a Governmental Carbon Scorecard. The state government is then to work to reduce its emissions 10% by 2012, 25% by 2017, and 40% by 2025. To achieve that goal, state buildings constructed in the future will be energy efficient and include solar panels whenever possible. Office space leased in the future must be in energy-efficient buildings as well. Any purchased state vehicles should be fuel efficient and use ethanol and biodiesel fuels when available. State government will also seek to partner with an energy-efficient rental-car company for the 2009 contract. [Executive Order 07-127:] Immediate Actions to Reduce Greenhouse Gas Emissions within Florida. This order directs the adoption of maximum emission levels of greenhouse gases for electric utilities. The standard requires a reduction of emissions to 2000 levels by 2017, to 1990 levels by 2025, and by 80% of 1990 levels by 2050. Florida will also adopt the California motor vehicle emission standards, pending approval of the US Environmental Protection Agency waiver. The standard is a 22% reduction in vehicle emissions by 2012 and a 30% reduction by 2016. Florida will also require energy-efficient consumer appliances to increase efficiency by 15% of current standards. Governor Crist also requested that the Public Service Commission adopt a 20% Renewable Portfolio Standard by 2020, with a strong focus on solar and wind energy. [Executive Order 07-128:] Florida Governor’s Action Team on Energy and Climate Change. Governor Crist will appoint diverse stakeholders to a Governor’s Action Team on Energy and Climate Change. Team members will create a Florida Climate Change Action Plan that will include strategies beyond today’s Executive Orders to reduce emissions, including recommendations for proposed legislation for consideration during the 2008 Legislative Session and beyond. "I will bring together the brightest minds to begin working on a plan for Florida to explore groundbreaking technologies and strategies that will place our state at the forefront of a growing world-wide movement to reduce greenhouse gases. Florida will provide not only the policy and technological advances, but the moral leadership, to allow us to overcome this monumental challenge." - Governor Crist. 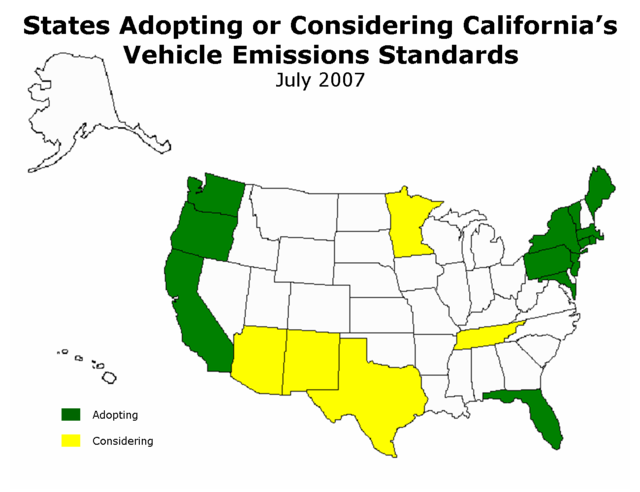 The Governor's Executive Orders make Florida the thirteenth state in the nation to adopt the California greenhouse gas tailpipe emissions standards (see map below, from Green Car Congress). The thirteen states planning to adopt the California tailpipe standards are awaiting a federal waiver from the Environmental Protection Agency that would allow them to implement the regulations. The EPA concluded public hearings on the waiver at the end of May, but has yet to issue a decision. US Representative Jay Inslee (D-WA) recently introduced a bill designed to force an EPA decision on the waiver within 30 days of the passage of the bill or by September 30th at the latest. Florida also joins 14 other states with emissions reduction targets or mandatory emissions reduction law on the books (see previous post). 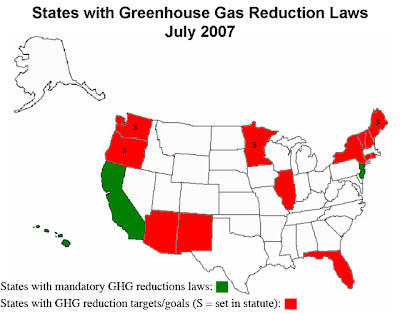 If implemented, the provisions on the Orders mark several firsts for a Southern state, including the first Southern state to adopt the California GHG tailpipe standards, the first Southern state to adopt a Renewable Portfolio Standard and the first Southern state to set greenhouse gas reduction targets. As usual, more and more states continue to lead the way on the climate change regulations while we await comprehensive action from the federal government. Adding Florida to the list of 'climate leader states' is an important milestone. As noted above, Florida is the first Southern state to get in the game. Additionally, as the wonderful mapmakers at Sightline have illustrated (see previous post), Florida's emissions alone are not insignificant, even in global terms. The emissions of the states of Florida and Georgia combined are roughly the same as the total emissions of the entire nation of France, according to Sightline. Bravo to Governor Crist and to Floridians for taking a leadership position and joining the fight to solve the climate crisis!